Donate your old cell phone for a good cause. October is Domestic Violence Awareness Month. 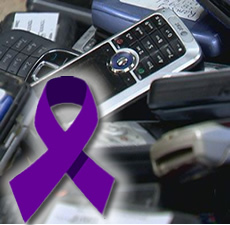 National Coalition Against Domestic Violence (NCAVD) partnered with Cellular Recycler to create unique fundraising program to raise money in the fight against domestic violence. Your old phones will be refurbished and resold. The revenue generated from the sale will be used to support NCAVD programs that help end violence in the home. Cell phone donation boxes are available outside of the Library’s south entrance. Donation acknowledgement forms are available upon request.